PhD student Ashley Cannaday, at left, says it has been “fantastic” to have Xerox fellow Nancy Aguilera, at right, working in the lab with her this summer. 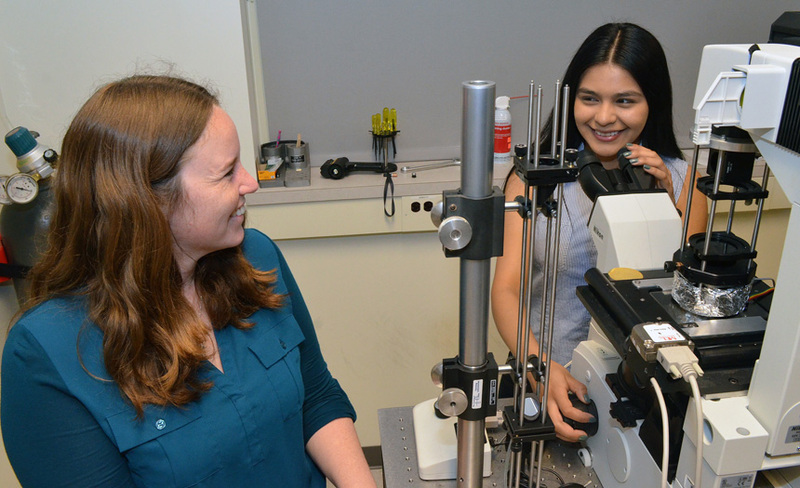 Nancy Aguilera is spending the summer testing a novel use of laser beams to measure the size distribution of organelles within a cell. This is her first research experience, thanks to the Xerox Engineering Research Fellows program. Yiheng Zhou, a rising senior in computer science, is data mining this summer. Working in the lab of Jiebo Luo, associate professor of computer science, Zhou is analyzing Instagram messages to see whether a broad range of risky behaviors correlate to drug use. This is not his first research experience. However, as a Xerox fellow, it is his first opportunity to truly immerse himself in a research project. Twenty-five other students in the Hajim School of Engineering & Applied Sciences successfully competed to participate this summer in the Xerox fellows program. They will showcase their projects at a poster session starting at 9 a.m. Friday, July 29, in the Munnerlyn Atrium at Goergen Hall. The program “is a fabulous experience for the students who are able to participate,” said Steven Manly, director of undergraduate research for the College. It is one of many examples of the University’s commitment to providing research experiences for undergraduates. This summer, for example, the College is helping to support 130 other undergraduates pursue research in Rochester and elsewhere through the REACH and Research and Innovation Grant programs. Now in its seventh year, the Xerox fellows program is part of the University’s David T. Kearns Center for Leadership and Diversity, and is funded through the Xerox Foundation. Of the 184 students served by the Xerox Engineering Research Fellows Program since 2009, a total of 39 percent are female and 24 percent are underrepresented minority (URM) students. Of those who have graduated, 61 percent have enrolled in graduate school.. In addition to hands-on research experiences, the program also offers seminars and training sessions -- on taking the Graduate Records Examination, for example -- to support fellows who want to go on to graduate school. Faculty members, who volunteer as mentors, and their PhD students also benefit when top undergraduates contribute to their research. Many of the Xerox fellows continue their projects into the following school year, leading to papers that are presented at conferences or published in journals. “They learn and I learn,” says Renato Perucchio, professor of mechanical engineering, who has mentored eight Xerox fellows over the years. Breanna O’Reilly is setting up a custom bioreactor that will be used to cultivate tendon replacement tissue grown from stem cells. Catherine Yip is using nonlinear finite element analysis – a computerized method for predicting how material reacts to real-world forces -- in the quest to protect a culturally and historically significant church in Peru from earthquakes. Luis Nova is working on a novel “virtual 3-D conferencing room” as a way for understanding and improving teamwork and group dynamics by giving participants automated feedback. Dyreek Brathwaite, Rebecca Gillie and Devanjith Fonseka are helping to fine tune a novel microfluidic chamber to help address a pivotal question in human hearing loss. Ariana Cervantes is using architectural biometrics and 3-D modeling to show how 19th-century train stations in Canada and Turkey often diverged from the blueprints created elsewhere, in ways that reflect local cultures and traditions. Matthew Dombroski is analyzing the movements recorded by accelerometers worn by participants in a clinical trial to help detect and assess Parkinson’s and Huntington diseases. Ronnie Colon and Jinge Wang set up a chamber to study the mechanics of how fluids flow around an obstacle, and the potential for reactive mixing in the “wake” zone behind it. This could help explain blooms of plankton behind islands and have applications for carbon sequestration and enhanced oil recovery.